Not many would think of Italians as being big egg Eaters, but if you thought that, you’d be wrong. Italians probably eat more eggs than Americans, and they certainly have more ways to prepare them, especially in the form of the marvelous Italian Frittata. Italians eat Hard-Boiled Stuffed Egg at Wine Bars all over Italy, and they eat all kinds of Frittati mostly for lunch, but for dinner with a salad or as a late night snack as well. 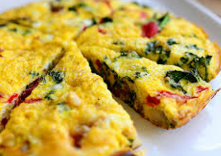 The fillings for Frittata are endless, with spinach, spaghetti, potato, and mushroom being most common. One famous Italian Egg dish is Uovo en Purgatorio, a dish of a couple eggs cooked in spicy tomato sauce and serve over toasted Italian Bread. But when it comes to Italian-Americans vs. our Italian brethren in Italy, Italian-Americans eat quite a bit more eggs than Italians in Italy. Where Italian-Americans beat out Italians in Italy in egg consumption is in the area of Egg Sandwiches, of which we just love and is our little secret, Italian-American Secret that is. American’s of other ethnic origins might not know of these tasty little sandwiches as we mostly eat them at home and the only Italian Egg Sandwich you are likely to see in an Italian-Deli is one of Sausage Pepper and Eggs. And you’re gonna have to go into a real heavy duty Italian neighborhood in Philly, Chicago, Brooklyn, and other parts of New York to find one, and even then you’re not gonna see many around. My favorite Egg Sandwiches are the previously mention Sausage Pepper & Egg and one my dear Aunt Helen (born in Salerno) taught me way back when. It’s a sandwich that’s not that well known and is sort of a family secret. I’ve cooked it for my friends, who have all gone nuts for it, and love it so much that since we have a good number of dinner parties, my friends asked me to top crostini with this egg sandwich filling. Oh, “So what is it,” you want to know? Well, it’s quite simple, but supremely tasty. It’s spinach sautéed with butter and olive oil then mixed in with eggs (Scrambling) and top quality grated Parmigiano Reggiano or Grana Padana Cheese. The result is amazing. One day I went over to Aunt Helen’s house to pay a visit to her and my Uncle Frank. As always Aunt Helen asked me if I wanted to eat. Well, more of an order than a question. “Heck yeah,” Aunt Helen, not what I said, but in my mind. OK, is what I said to Aunt Helen, one of the greatest Italian home-cooks this country has ever seen, her food was marvelous. Aunt Helen’s Meatballs are my all-time favorites. Anyway on this day, Aunt Helen gave me this sandwich. 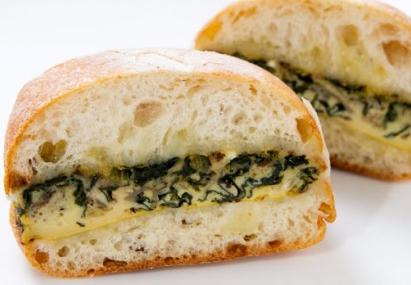 It was a Sandwich of Eggs scrambled with spinach and Parmigiano, and I was in Love at first bite. Dam, this sandwich was a revelation. I asked Aunt Helen how she made it, she told me and the rest is history. I made it for my friends who all went nuts for it as well, and I still make it to this very day, keeping my Aunt Helen’s memory alive, I always think of her and that day whenever I make it, Panino di Uovo e Spinaci. Yumm! You just gotta try one. So Frittata? They are quite a wonder this flat little Italian Omelette that can take on just about anything, the fillings that is. You can make them with an assortment of vegetables, with mushrooms, Spinach and Cheese, or my favorite, which I’ve never seen in Italy, I think I invented it, cause I’ve never seen anyone else make it, is Sausage & Peppers. Dam tasty. Frittata are amazingly versatile. In Italy they are most often serve thin and whole for most typically lunch, with maybe a little salad on the side. 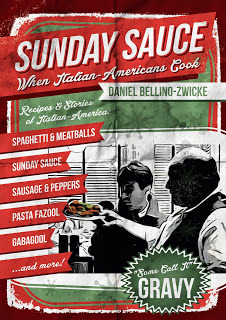 Over here, we Italian Americans like to make them thicker and cut them in to wedges to snack on, stuff in sandwiches, and bring along on a road-trip or in a picnic basket with Salami, Cheese, Bread and Wine. Now that’s a good picnic basket. Place sausage in a small pot and cook in low simmering water for 10 minutes. Remove sausages from water and cut in to 1” pieces. 3. Sauté sausages in a 10” non-stick pan with Olive Oil for about 6 minutes at medium heat until all surfaces of the sausage is nicely browned. 4. Remove sausage and keep on the side. Put the Bell Peppers in the same pan. Sauté over low heat for 10 minutes. Add onions and sauté for 8 minutes. 5.Add Sausages back to pan and continue cooking on low heat for 2 minutes. Add garlic and cook for 3 minutes. 6. Beat eggs in a large bowl with salt and pepper. Add grated cheese and most of the chopped parsley, reserving some of the parsley to sprinkle over the finished Frittata. 7. Turn the heat up high and cook for 1 minute. Add the eggs and cook while constantly mixing the eggs with other ingredients. 8. When most of the eggs have cooked but there is still some uncooked eggs on top, take the pan off the heat. Let cool a few minutes. Take a plate that’s larger than the diameter of the pan you’re cooking in. Place the plate over the pan, then flip over so the uncooked part of the Eggs is on top of the plate. 9. Add olive oil to pan and turn heat up high for 1 minute. Slide the frittata back in to the pan with the raw egg side of the frittata going in to the hot pan. Turn heat down to low and cook for about 2-3 minutes until the eggs are completely cooked through. Cut into wedges and serve hot, or put into a picnic basket or your lunch box and enjoy whenever.